This article is written by Copenhagenize Design Company's urban planner, Leon Legeland. Originally from the least- bicycle friendly city in Germany, Wiesbaden, he has lived, studied and worked in Vienna, Malmö and currently Copenhagen. He has a master in Sustainable Urban Management and is currently finishing his second master in Sustainable Cities here in Copenhagen. He has been working with us for eight months and is motivated to support and plan the needed paradigm shift in mobility in Germany and particularly in Berlin. Mikael will be speaking at this year's VivaVelo congress next week in Berlin, on April 18, 2016, so we thought we’d take a closer look at the status quo and current buzz about urban cycling in the German capital. In the 2015 Copenhagenize Index, we saw the city slip from 5th in 2011 to 12th in 2015. Still, Berlin is in the Top 20, but where is the city headed in the next few years? Things are happening in the city. Both things that make us optimistic and excited and things that make us want to throw up a little bit in our mouth. If we look at the baseline, progress is slow and soooo last century. There appears to be a total disconnect between the declared municipal strategy and what is actual happening (or not happening). 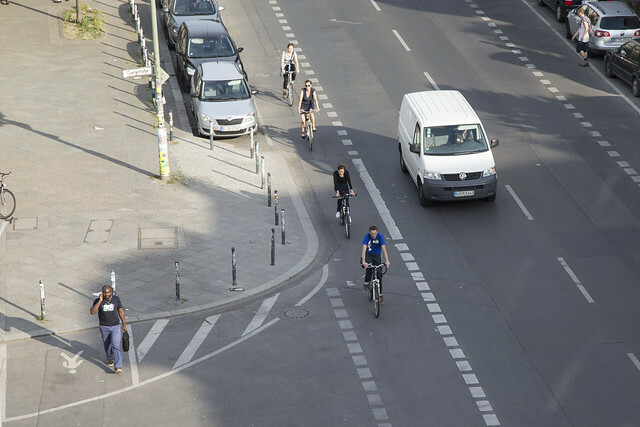 The Senate in Berlin, on some level, understands that urban cycling improves the quality of life and that it has to be promoted and supported. The official bicycle strategy is full of promising initiatives and visions - more than many cities. The city has a goal of hitting 20% modal share by 2025 and wants to invest in bicycle infrastructure and parking and to improve the overall bikeability of the city. The Senate initiated a collaborative online platform that identified and discussed fifty dangerous intersections that get will be prioritised for a bicycle friendly redesign. It was a clever move to get local insights about needs and problems with added subjective expertise. This all sounds fine and good, but the reality is far-removed. Out of fifty intersections, only three intersections have been redesigned in the past three years. Safety in intersections is key. Since 2000, almost 200 people have been killed on their bicycles in Berlin. Tragic. No doubt about that. Instead, however, of accelerating the redesign of dangerous intersections and building Best Practice infrastructure along roads, the city decided instead to merely advertise their own lack of desire for change with large digital signs aimed at motorists (above - spotted on this Facebook group). “Every two hours a bicycle accident happens, keep 1.5m distance”. We suppose the idea - however primitive - is good. Creating awareness among motorists that cyclists are present in the city. It is also a bold advertisment branding cycling as dangerous. There is little messaging that would encourage motorists - who cause many of the ills that cities suffer - to consider a shift in transport mode. Finally, it shows in no uncertain terms how outdated, flawed and incompetent the current traffic planning and road design is. The solution is simple: build adequate, protected bicycle lanes and redesign your intersections. You won’t need warnings, you’ll avoid branding cycling as dangerous and you will save vast amounts of money on public health. 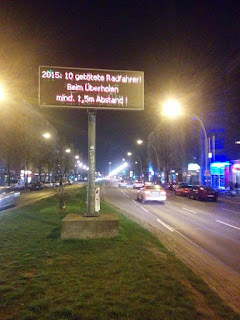 It’s one thing wasting money on digital signs, but what’s worse is that Berlin is not even spending its annual budget for bike infrastructure. The Senate failed to use €4.6 million that was available to it. The City spends €3.80 per person on bicycle infrastructure. Embarrassing considering that in Copenhagen, that number is €25. In Oslo, it’s as high as €35. But even cities like Paris, London and Madrid spend more than €12 per person. Berlin is not even spending what they have, let alone finding more money to modernise their transport and keep up to speed with global trends. A recent investigation by Berliner Morgenpost newspaper mapped all the roads in Berlin in regards to their bicycle infrastructure. They found that 55% of all main roads in Berlin have bicycle “infrastructure”. That sounds nice, but it includes narrow painted lanes and bus lanes that can be used by bikes. The painted lanes are generally only 80 cm wide - far from the 2.5 meters dicated by Best Practice - and are often clogged with parked cars. 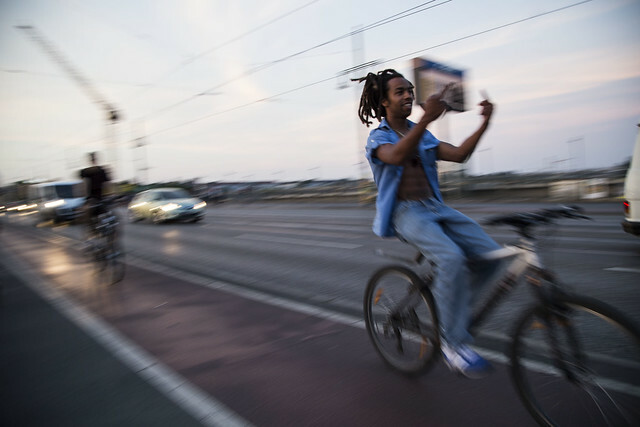 The study found that 338 of Berlin’s main roads do not have any bicycle infrastructure at all. Cycling in Berlin is not at all intuitive. It’s confusing and irritating. There is no uniform design or cohesive, comprehensive network. In a nutshell, the municipality talks the talk, but doesn’t walk the walk. Progress is painfully slow and there is little Best Practice design. Politicians blame the tricky administrative division between the Senate and the districts, as well as the lack of professional staff to get projects pushed through to completion. Basically, the money is there but there are no planners to use it. Don’t think stuff doesn’t get done in Berlin. 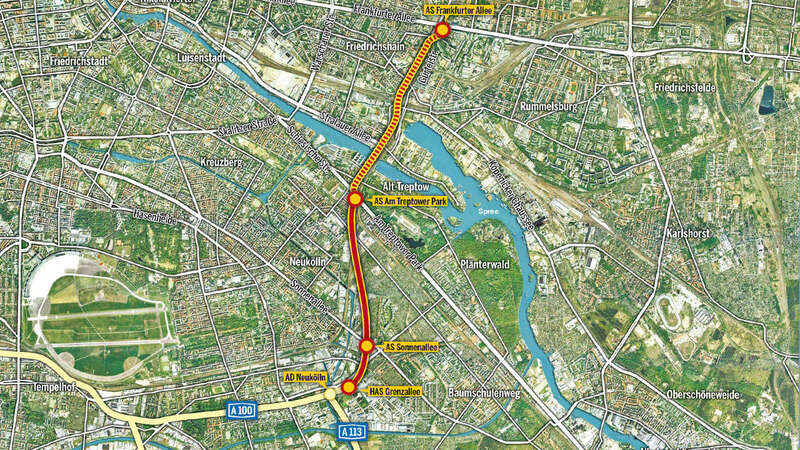 The largest infrastructure project in the city - currently under construction - is the extension of the Autobahn 100 from Neukölln to Treptow. Yep. A highway! In 2016. Bizarre. Do you know what the city will get for the €480,000,000 price tag? A whopping (not) 3.2 km long, six-lane highway labelled “Piece of Berlin”. They say the same thing as people have been saying for 60 years - that this highway will magically improve the city’s traffic environment, increase quality of life, economic growth and reduce automobilie traffic and congestion. Seriously. Despite the fact that no highway has done this anywhere in the past 100 years. The only thing we’ve learned over the past century is this: If you make more space for cars, more cars will come. Traffic in Berlin will stay the same - and probably become worse. A six-lane highway cannot improve quality of life. Other cities are tearing out their last-century monuments to failure, not building new ones. The extension of the A100 requires the demolition of a couple of apartment buildings, the felling of hundreds of trees, the relocation of an old landfill and is a extremely complicated construction due to high groundwater level, noise protection, and so on. This is a madman’s playground for German Autobahn engineering, not a “Piece of Berlin”. Even more sad is the fact that a further extension of the A100 - adding on another 4.1 km - is currently being discussed and is expected to be approved in the next two years. According to some preliminary calculations, the cost may hit €1 billion, due to a tunnel under the Spree River. There will be the usual demolishing of buildings, the eviction of clubs and cultural institutions and more chopped trees. Let’s hope the people of Berlin can mobilise and stop this madness. Wild, isn’t it? The municipal departments are able to plan, approve, finance and construct a complicated, monster highway for a total of €1.4 billion but they can’t seem to find money to move far more people through the streets of Berlin with a network of uniform, Best Practice bicycle infrastructure based on designs and experience over 100 years old. Berlin - more than many cities in the world - is all about the citizens. They seem to get it. In the inner city, the modal share is 18% for bicycles. Car traffic is at 17%. Urban cycling is mainstream and is ready for massive growth. Cycling is growing by 5% every year - even though only 3% of all traffic space is dedicated to bikes. All Berliners need is a group of politicians currently residing in this century. Citizens are also doing it for themselves. There is an ambitious group of activists, planners and regular citizens who happen to use bikes to get around and they are fed up with the inactivity of the Senate. 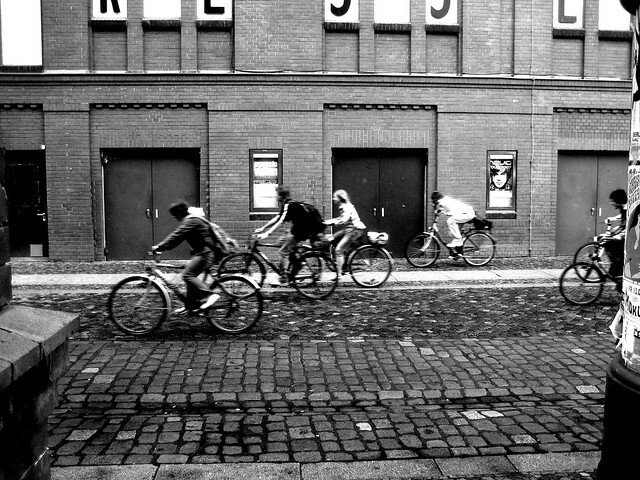 The Berlin chapter of the national cycling NGO - called ADFC - were notorious for their displeasure with infrastructure. A hangover from this school of thought. Luckily, they are now supporting the referendum. The Volksentscheid - Fahrrad is behind a cycling referendum that is currently shaking the Senate out of its drowsiness and insisting that more has to be done to make Berlin a bicycle friendly city. The group have established ten goals that are incorporated in the first German bicycle law. The goals include the transformation of 325 km of roads into bicycle streets, safe bicycle infrastructure on every main road, a safer redesign of 75 intersections per year, quick maintenance and fixes along bike lanes, 200,000 bike parking spots, fifty stretches with a green wave for bikes, 100 km of bicycle highways, police on bikes that ensure the bikeability, more bicycle planning staff in council positions and communications campaign that prepare Berlin to become a bicycle friendly city. Here is a link to their 10 demands in English. All goals are bound to a timeplan. There are great activists out there in the world, but this group has taken it to the next level. This might seem a bit optimistic. But consider this. The ambitious goals of the Cycling Referendum will cost about the same as just one kilometre of the A100 extension. That’s it. Add to that the fact that one kilometer of cycle track is paid off in under five years and the referendum plans will be making money for the city in no time. The A100 never will. Car traffic is the minority group in the transport paradigm and yet the City is spending obscene amounts of money to increase car traffic in Berlin. The Cycling Referendum has jumpstarted a modern and much-needed discussion and put political pressure on the municipal officials. Instead of the usual, ineffective critical mass events, the group around the Cycling Referendum use a clever way to show their dissatisfaction - by offering best practice alternatives. This year, Berlin is electing a new Senate, and cycling is becoming a hot issue on the political agenda. The Cycling Referendum and its objectives get a lot of media coverage, which further fuels the political debate. We at Copenhagenize Design Co. fully support the goals and plans of the Cycling Referendum (Volksentscheid Fahrrad). Berlin can do so much more and it is time to stop the backward-directed traffic politics. It is time for a paradigm shift away from a last-century, car-centric planning approach and towards a modern and inclusive one.